Posted at: 3/18/2010 01:59:00 AM . I found a similar idea on givemeneither.com and thought it was a great idea to mention to my readers. 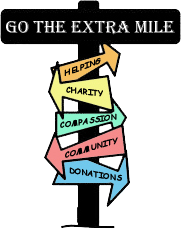 Go the Extra Mile will be our way of using our coupon and discount knowledge to help others. When you find items under a dollar, consider purchasing two so you can donate one to a local food bank or community center. 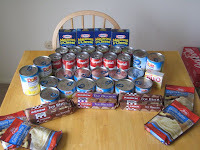 I recently donated a large amount of non-perishable food to my local family services' office. Everything you see on the table cost under $5 (total) after coupons. Besides food banks, many communities have a place that helps people out with regular household items. So if you see a sale on things like soap, toilet paper, or anything else, please think about those in need. I'm not telling you to go spend a fortune, but a dollar here and there will really add up over time to help people. As always, when I find great coupon I will post them here. If the object is under a dollar I will tag it with the extra mile label. Please consider the idea and help others in your community.